Forest Ridge is a bedroom community located near Fort Saskatchewan, and if it's not on your radar yet, it should be. This up-and-coming community has a lot of convenient features, and there will be even more benefits as the neighbourhood grows. Learn more about this community, then spend an afternoon in the area to see just how quiet and peaceful it can be. Whether you’re looking to downsize, just starting out, or want to find your forever home, you’re sure to find something that meets your needs in Forest Ridge. With the most affordable starting prices, the duplex homes in this community are sure to make you smile. They have attached garages and all the space your family needs at a price you can afford. People are also loving the laned style homes. These homes have a quaint look to the front exterior because they don’t have a garage attached. However, those who want even more space will flip for the executive style homes available here. You can get a three-car attached garage in a home with more than 2,000 square feet of living space. 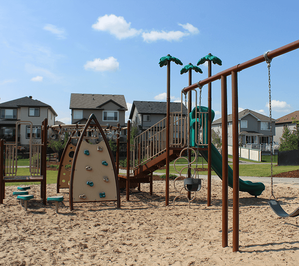 Builders in this community include Pacesetter Homes, Santos Homes, and Victory Homes. You should take the time to tour each builder’s showhomes to get a sense of which home style is right for you. Once you’ve settled on a community, you then get the opportunity to choose where to build in that community. You’ll be pleased with the options available to you within Forest Ridge. Builders are currently finishing up the current phase, and the remaining lots are all close to future green space with plenty of room for future expansion and new amenities. If you choose Forest Ridge as your home, you won’t have to go far to enjoy the great outdoors. There are paved trails and green spaces throughout the community, and you can also walk to Pryce Alderson Park. Here, you’ll find a spray park for the kids to cool down in the summer. If you’re willing to drive just a little bit, you can find a wide array of family-friendly parks throughout the area, including the Wetland Conservation Area. Forest Ridge is about a 15 minute drive from the northeast part of Edmonton. You might worry that being this far away from the hustle and bustle can mean that you’ll have trouble when it comes to basic amenities like banks and grocery stores, but this simply isn’t the case. Those living in Forest Ridge have easy access to just about everything they could need. You’ll find stores like Walmart, Home Depot, and Shoppers Drug Mart nearby. You can work out at the Dow Centennial Centre, see a doctor at the Fort Saskatchewan Community Hospital, or grab a bite to eat at Original Joe’s. Sure, you might want to head into Edmonton for date night or other special events, but the Forest Ridge community and surrounding area definitely offers convenient access to everything your family needs. Despite being outside of the city limits, families actually have plenty of choices when it comes to schooling for their children. There are great public schools, as well as Catholic school options. Your children will be able to learn and grow with other friends from their neighbourhood. Naturally, this community really appeals to those who work for the local school district or for companies like Dow Chemical or Agrium. You’ll enjoy an easy commute if you work in the Fort Saskatchewan area. 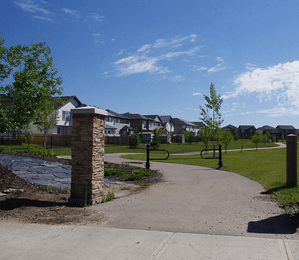 However, Forest Ridge also appeals to those who work in the area downtown Edmonton and want to live in a place where they feel like they’re getting away from it all. It only takes around 30 to 40 minutes to drive to the downtown core. Does that commute sound like a hassle? If you commute during peak hours, you could take advantage of the Commuter Transit Service. This will take you to the Clareview LRT station, where you can easily get to your place of work. It’s a great option for those who prefer to read or do some work while they commute. With the conveniences of city living in a quieter environment, you’ll find that Forest Ridge might just be the perfect place for your family. Once you see what your life could be like, it should be an easy choice to make.